The Cooperative Program continues to provide needed resources to fuel the fire of evangelism and missions. I am thankful for the demonstrated generosity of Florida Baptists in this united effort of sacrificial giving. 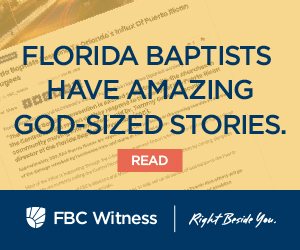 The decision of the churches of the Florida Baptist Convention to divide the CP resources in a 51/49 manner has been richly blessed by the Lord. I am pleased to report that 2018 Cooperative Program giving exceeded the 2017 Cooperative Program receipts. The commitment for 2019 is that we will continue to follow the 51/49 split for our $30M approved budget. I announced at the 2018 Florida Baptist Convention that every dollar received over our $30M would be 100% sent to the Southern Baptist Convention Cooperative Program. I rejoice to share that the month of January 2019 ended with our churches giving $3,012,974 for CP. Our monthly budget requirement is $2,500,000. We have only had five months since 2010 that have exceeded $3M. Your Florida Baptist Convention Team remains deeply committed to being ‘Right Beside You’. We are driven by the conviction that the Convention exists for Florida Baptist churches and not the churches for the Convention. Our focus remains on partnering with our churches with Cooperative Program resources in church planting, church revitalization, evangelism, missions, discipleship, next gen ministry, prayer, mission partnerships, and other requested ministries. We are blessed to steward millions of dollars into Florida Baptist churches for Kingdom ministry. I believe that 2019 will be an amazing year for CP giving in Florida. You are reaching Florida and the world as you give through the Cooperative Program. Thank you Florida Baptists for leading through the generosity of sacrificial giving.